Dates and Probabilities for the Last Spring Freeze Across Nebraska. Check the likelihood of low (10%), medium (50%), and high (90%) risk of freeze for selected dates across the state, based on 30 years of data. How Dry and How Cold Was it This Winter? Al Dutcher puts Winter 2013-2014 in perspective, reviewing temperature, precipitation, soil moisture, and soil temperature data. 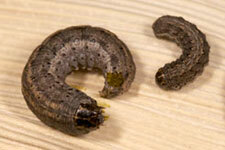 Get a Jump on Army Cutworms in Alfalfa, Wheat. Western Nebraska entomologists recommend an early start to insect scouting as temperatures warm and these crops come out of dormancy. Crop Entomologist joins Faculty at West Central REC. Julie Peterson plans to focus on resistance management related to insects, integrated pest management, and how cultural practices affect both pest and beneficial insect populations. Market Journal Looks at How Corn Planting Rate and Row Spacing Affect Yield. Other segments look at the grain markets and predictions for the USDA prospective planting report to be released Monday. Nebraska Hall of Agricultural Achievement Honors Moeller, Taylor and inducts 12 members representing the best of the state's ag industry. Farmer's Gift Leads to New Facility, Stumpf Wheat Research Program. Ground was broken on March 21 for the new UNL wheat breeding facility at Grant. The gift included 640 acres of farmland in Perkins County.